About a month ago, I featured a week of filled breads; that is, breads that have a clear distinction between “bread” and “what-have-you” (e.g., a calzone). This week, as a sort of complementary theme to that one, I’ll be making bread with things mixed in; that is, breads that have the “what-have-you” added to the dough in such a way that it’s hard to draw a clear boundary between the two. 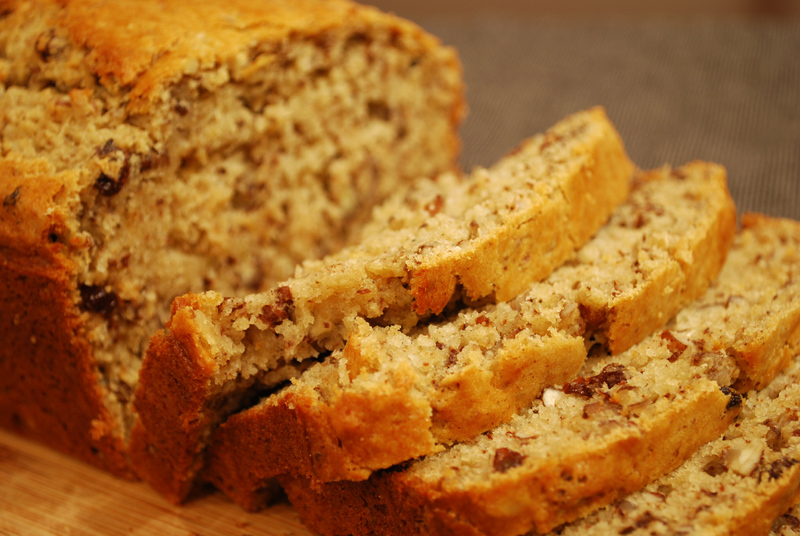 Quick breads (like banana bread and similar tea breads) are classic examples of this idea. Plus or minus a few ingredients, and they’re all basically the same base, just flavored with whatever. 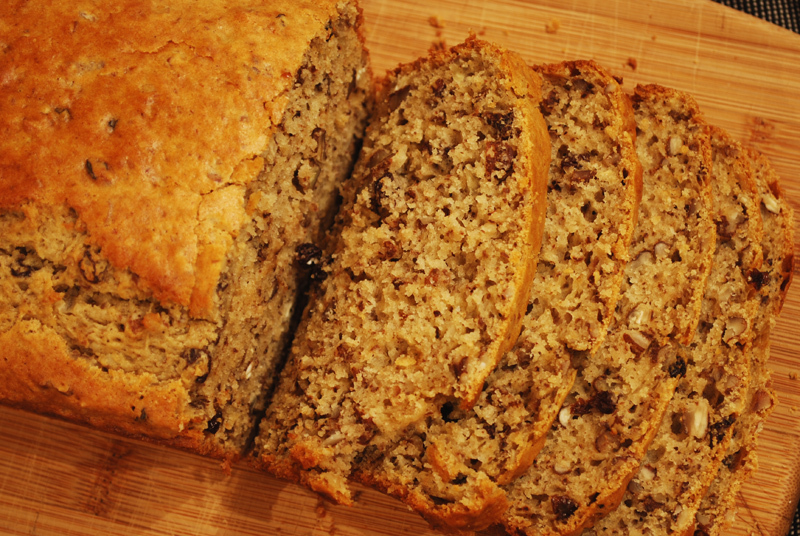 Take the banana out of the banana bread, and what exactly do you have left? I don’t know either, but I know I like it better with the banana left in. I certainly can’t ignore quick breads, since they fit so perfectly into the theme, but I’m actually going to focus more on yeasted breads this week. I think people tend to shy away from anything that could possibly complicate a yeast bread (isn’t it already hard enough? ); but hopefully, I’ll prove that wrong by the end of the week. Adding a little extra note of flavor is not only easy, but it can take any mundane loaf from boring to brilliant with just a few extra minutes time. The bread for today isn’t really anything groundbreaking, but it’s such a great combination of flavors that I had to include it. I’ve made it many times to great success ever since I ripped it out of Gourmet Magazine (by the way, the pecan deviled ham salad on the same page is fabulous), and have finally nailed down my modifications, as seen below. Pecans and currants aren’t generally seen running in the same circles, which is a shame, since they complement each other so well. I enhance the jamminess of the currants with a nice, long bath in a bit of brandy, which takes on a currant-y flavor itself, infusing it more fully into the batter. I was going to say something here about the flavor of the pecans, but words fail me. I am reminded of a time when I was working at Commander’s Palace, one of the finer restaurants in New Orleans, when a Canadian guest (unfamiliar with the pecan) asked me what the difference between pecans and walnuts was. And I was thoroughly stumped! I mean, I know the difference, and can pick out which is which in a blind taste test; but to describe the difference? I found it absolutely impossible. Maybe walnuts taste earthier? Pecans are a bit brighter? Neither sounds exactly right. So I am useless to describe it, but take that pecan flavor that you know, and pair it with a slight richness of fruit. Now wrap it all up in a lightly-spiced, fluffy, moist bread, and you’re halfway there. The other half is the smell. As the pecans toast in the oven, you can smell the oils beginning to come out a bit, mingling with the aroma of the brandy and currants sitting on the counter. And when you combine it all with the peppery-spice smell of ginger and allspice, and catch wafts of the milk and sugar caramelizing from inside the hot oven…. Well, it just doesn’t get better than that! 1. Pour the brandy over the currants. Let stand, covered, for at least 30 minutes, and up to 48 hours. 2. Preheat oven to 325° F. Butter a 9 x 5 inch loaf pan, and set aside. 3. Whisk together dry ingredients (flour through ginger) and pecans in a large bowl. In a measuring cup, whisk together remaining wet ingredients until combined well. 4. Add wet ingredients and currants with brandy to the dry ingredients. Stir quickly until just combined (some lumps are okay). Transfer batter to the prepared loaf pan, and bake until golden brown and baked through, about 1 to 1 1/4 hours. 5. Cool in the pan on a rack for about 10 minutes, then turn out onto a rack and cool thoroughly before slicing and serving. 1. This bread is delicious warm, but will keep in an airtight container at room temperature for a few days. If not eating within that time frame, freeze and thaw later in a warm oven. 2. To toast the pecans, spread on a baking sheet and bake at 350° F for about 8 minutes, stirring occasionally so the ones on the outside don’t burn. Let cool, then chop. I prefer to chop nuts by hand, since I like the more even and chunky texture, but a food processor will do the job just as well. One of my favorite breads is a recipe from one of Jamie Oliver’s cookbooks, just simple bread dough with some left over prosciutto bits and blue cheese mixed in then baked in little knobs. Well, he baked them in little terra cotta pots, but lets be real here. Sort of like savory cinnamon rolls. Yum! I think I know the one you’re talking about! Oh, I do love me some Jamie Oliver. Everything he cooks gets a nice bath of olive oil right at the end, and it’s always so delicious. It was great to meet you guys the other night! We’ll have to have y’all over sometime to help us eat some of this bread. Nice blog, by the way! Good luck with the continuing Home Cure.